Homestead Poi is located in Waiahole, Oʻahu. Hanale M. Bishop is a farmer and owner of Homestead Poi. He is partners at the farm, He Hawaiʻi Au, with his father Daniel Bishop. Poi-making-helpers include his brother Ikaika Bishop, a farmer in Punaluʻu, and Hanale’s partner Meghan Leialoha Au. 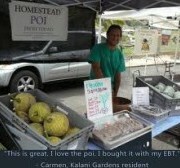 You can find Homestead Poi at Ben Parker School Farmers Market (where he also sells fruit, veggies, kalo starters, flowers, and medicinal plants) and also now at Kokua Market.